^ Rahvaarv rahvuse järgi, 1. jaanuar, aasta. Statistics Estonia. [10 June 2016]. 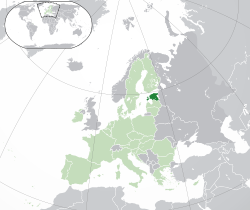 ^ ESTONIA – Look and you will see! (PDF). [27 July 2015]. ^ PHC 2011 RESULTS. Statistics Estonia. [26 January 2016]. ^ 5.0 5.1 5.2 5.3 Estonia. World Economic Outlook Database. International Monetary Fund (IMF). October 2016 [2017-03-12]. ^ Gini coefficient of equivalised disposable income (source: SILC). Eurostat Data Explorer. [5 January 2014]. ^ Ajaloost: Koolihariduse algusest. University of Tartu. 24 March 2010 [14 October 2013] （爱沙尼亚语）. ^ Haridus- ja Teadusministeerium. Hm.ee. [23 December 2010]. ^ Eelnõu algtekst (30.05.2001). [27 March 2015]. （原始内容存档于2007年6月21日）. ^ OECD Better Life Index. [27 March 2015]. ^ National summary sheets on education systems in Europe and ongoing reforms: Estonia. Eurydice（英语：Eurydice）. February 2009 [19 September 2009].